Here's a quick summary of what I've seen so far, including some low quality camera photographs showing what the posters look like. These are all the August issues of their respective magazines released back on 10th July 2014. There are some very mild spoilers for the first two episodes in the interviews so please skip them if that bothers you. Once again, Newtype was a big disappointment this month with no Judge End content at all. In contrast, Animage did much better than last month with a proper two-page article including a short interview with director Sano Takashi. Judge End is not a continuation of the previous Sengoku Basara anime (note: I think most people realise this but some plainly don't, so I'm going to mention it every time it's brought up in an article!). There are many warriors involved in the story this time and each has their own 'reasons' for being there. He thinks each of the four leads has their own charm: Masamune is true to his feelings, Yukimura has his straightforward 'hot' personality, Ieyasu has his own strength from within and Mitsunari's charm is his purity. He's aware that the series has a lot of appeal, and he tried to make each character's appearance in the first episode leave an impression for the benefit of first-time viewers. There will be content in the anime which wasn't in the original game, but he can't say any more than that at the moment. He likes the supporting characters like Kojuurou, Sasuke and Yoshitsugu and wants to give them his attention as they become more involved in the story later on. Out of all of the rivalries and master-servant bonds, his favourite relationship in the series is the one between Toyotomi Hideyoshi and Ishida Mitsunari. The countdown to the Battle of Sekigahara started with Ieyasu defeating Hideyoshi and each episode contains unmissable highlights. He hopes people won't miss a single episode. Sano seems really nice! We discovered in a previous article that he was a Sengoku Basara newbie when he first took on the role of director so it sounds as though he's done a lot of studying since then. The picture from the article looks like this. 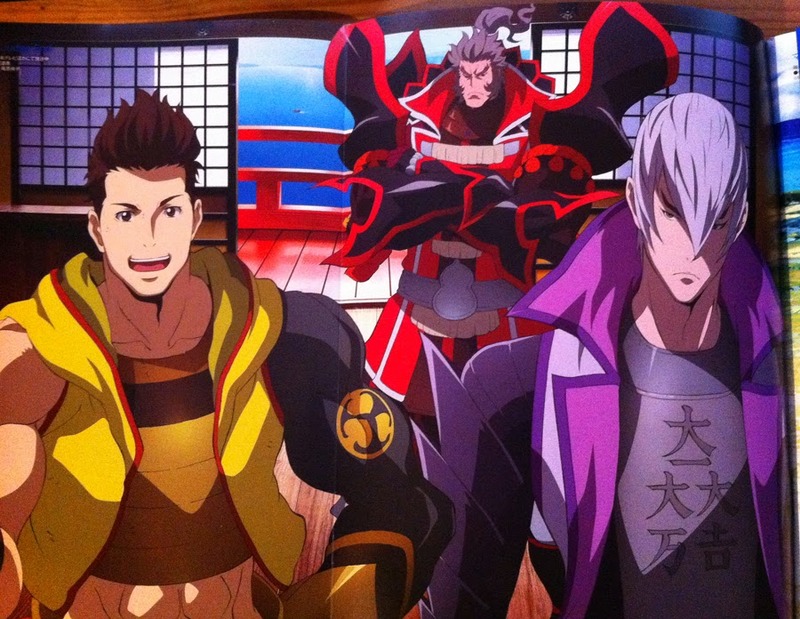 As a bonus, there was even a Sengoku Basara illustration in this month's Animage fan art gallery. Someone had drawn a picture of Sakon and Katsuie and the magazine's staff printed it next to the hopeful-sounding caption, "It's Shima Sakon and Shibata Katsuie who debuted in Sengoku Basara 4. Perhaps they might also appear in the anime.. ?". Next, I moved on to Monthly PASH! magazine. PASH! had a two-page Sengoku Basara Judge End article too, mainly focusing on the characters who supported the Toyotomi army. Hanbee, Yoshitsugu, Tadakatsu and Tadatsugu were all profiled along with Hideyoshi, highlighting how each of them had ties to Mitsunari and/or Ieyasu. A huge arrow marked 'one-way rivals' ran from Tadatsugu to Tadakatsu. I'd like to see that side of their relationship come out in the anime soon! Their exclusive comments were from animation producer Itou Kouhei, who has been interviewed about the series before. The first episode introduces a huge number of characters and has a lot of different scenes packed in. They want it to make people eager to move on and watch the next episode. The schedule they're on is really tough. It's the first time in their roles for the director and some other staff members. Many of the people working in the studio are Sengoku Basara fans, so they help the rest of the team out by giving advice whenever anyone has a question about the setting. Besides the leads, the characters who caught Itou's eye from the outset were Kojuurou, Sasuke and Yoshitsugu. Kojuurou and Sasuke take care of their lords when things aren't going their way, while Yoshitsugu secretly manipulates things behind the scenes to try to help Mitsunari carry out his revenge against Ieyasu. 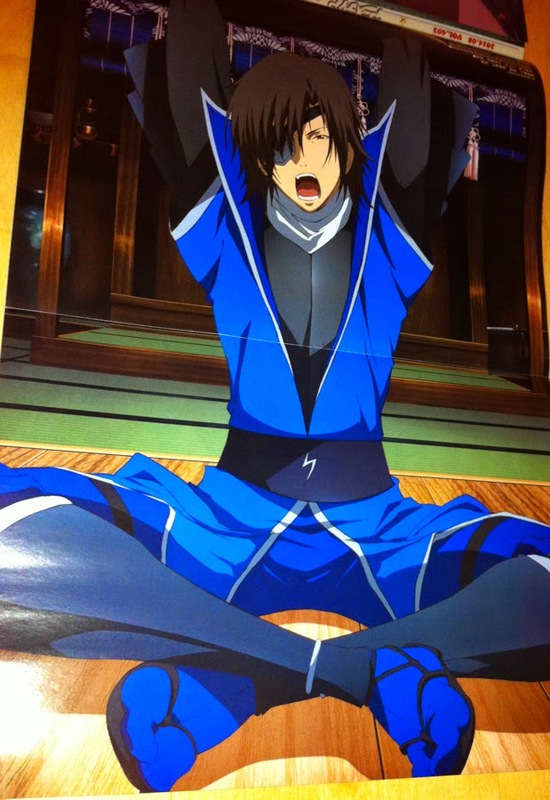 Animedia had a fold-out poster of Masamune stretching (?) without his helmet or weapons. 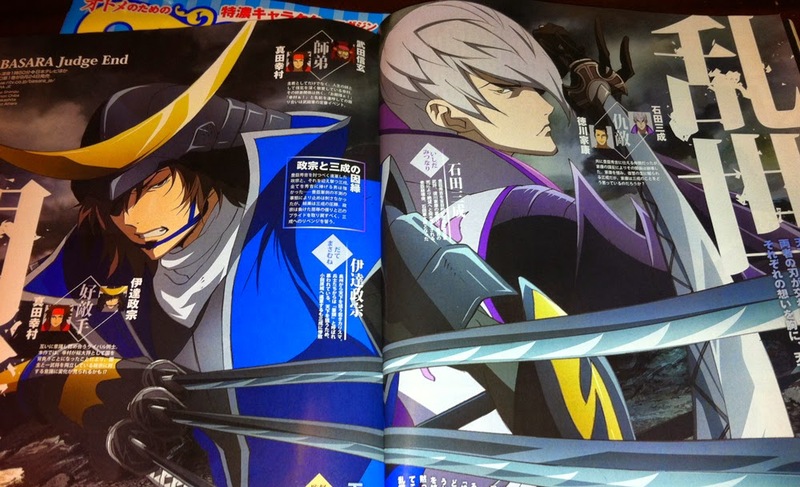 While there was no corresponding article this time, there was a small introduction to Sengoku Basara 4 in the gaming section. In addition, a fan had submitted a small drawing of Ieyasu, Mitsunari, Tenkai, Kingo and Keiji based on the last Butai Sengoku Basara stage play. Otomedia had good coverage as usual. There were short profiles for Hideyoshi, Ieyasu and Mitsunari and some words from anime staff member Takahashi Natsuko (series composition). Using the Sengoku Basara 3 game as a base, she wanted to show what each character was feeling and their reasons for heading towards Sekigahara, the site of the greatest battle in the history of the Sengoku period. She hopes people are looking forward to seeing the famous scenes from the game once again, and also the unique scenes they've incorporated in Judge End's version of the story. In this anime, each of the four leads has lost something. The anime depicts how they go on and find something to aim for. Motochika wants his revenge on Ieyasu - just like Mitsunari. She also name-dropped Motonari, Yoshitsugu, Keiji and Magoichi when talking about how everyone has their own reasons for participating in the battle. Takahashi also gave a few light-hearted thoughts on how the leads would spend the summer in a short column. There was a fold-out poster at the back of the magazine with a textless version of the main illustration from the article. It's rare to see Hideyoshi showing up on a pin-up poster! According to commenter Lumi S and the Viewster Twitter account, we should expect news from them this week and at least the first episode of the show. FUNimation also tweeted about Judge End to confirm that they were working on getting it up for its simulcast "as soon as possible", so hopefully those people waiting for the fun to begin won't be left without news too much longer. I wonder whether the delay might be caused by the scheduling in Japan? While fans with access to NTV (or the Internet) have been able to watch the show for more than a week, it doesn't debut in some parts of the country until late on Wednesday night. Perhaps NTV were unwilling to let the overseas streams begin until the first episode is available all across Japan? The Sengoku Basara Judge End Original Soundtrack is due to arrive on 3rd September 2014 priced at ¥2,500 before tax. It will feature new composer Tokuda Masahiro's background music and both the TV size and full-length versions of Ishikawa Chiaki's ending theme, Hokkyokusei ~Polaris~. The preorder listing is already up at Amazon Japan and the VAP store; expect regular import shops to start making it available very soon. 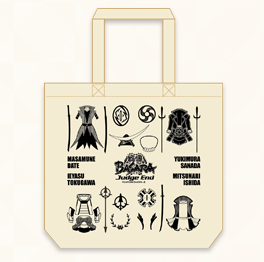 The anime's official website updated to add details of a new piece of merchandise due for release in Animate stores on 7th August 2014: the official Sengoku Basara Judge End tote bag. It will cost ¥1,000 before tax and is decorated with the four leads' signature armour. The website is also running a quick survey to find out what fans think of the show at the moment. Three respondents will be selected to win a copy of the Sengoku Basara 4 Special Package set - you'll need a Japanese mailing address to enter, though. Fans of the 'real time battle RPG' Sengoku Enbu -Kizna- will soon be able to combine bring their love of Sengoku Basara characters into their mobile gaming sessions thanks to an in-game event which commences on 18th July. 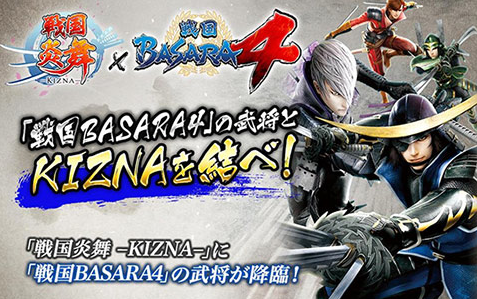 The collaboration is to celebrate two occasions: the first anniversary of Sengoku Enbu -Kizna- launching on Google Play and the upcoming release of the Sengoku Basara 4 Special Package on 24th July. The episodes will be weekly with no gaps planned, so episode six will air on 9th August 2014. This is so awesome. I'm really happy to see that Viewster is the first to get their simulcast arranged since Europe usually ends up missing out. Now we need the rest of the world to catch up and start their broadcasts too!